This page features cats that we post for our trusted independent rescuers. They are not necessarily Lifeline cats, but the rescuers do follow our guidelines, adoption procedures, and adoption application. Be sure to call the number shown with each group. Twyla is a total lap cat and loves people. She is super friendly and affectionate. She likes to sleep with you and cuddle. She’s vocal too and talks to you with her sweet little meows. She would be great with small children who would play with her and give her lots of attention. She likes having her foster mommy all to herself and chases the resident boy kitties away. Although she’s still young, she may prefer to be the only kitty in the house. These sweet kittens are just adorable! Sweet Pea is the pretty, all charcoal gray girl, very cuddly, who looks at you with such soulful eyes. Tiger is her brother, and he has an abyssinian look to his fur, gray with whitish ticking. They have a very mild condition of cerebella hypoplasia, which makes them shake their heads a little. However, no meds are needed and they can run, jump, & chase just like any other feline! Call the number shown to meet them. Pounce your mouse on a picture to enlarge & see the slideshow. 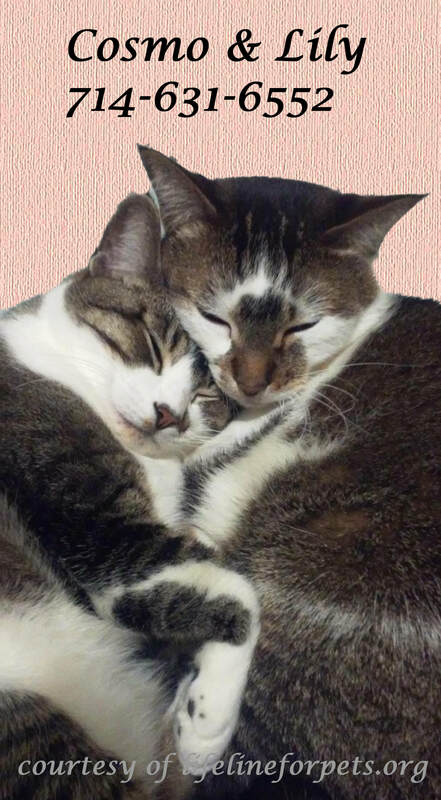 Cosmo and his sister, Lily, are a purr-fect pair! Their foster mom says that they have a "lovely demeanor, friendly, goofy, cuddly, & calm. Cosmo loves to put his head on your shoulder, and Lily's favorite place is on your lap or near your feet. They like to play with ribbon and they love to lounge around with anyone who visits because they're very friendly. Cosmo is the "smarty pants" and Lily is the beauty." If you've got the LOVE, he's got the CUDDLES! Are you looking for a sweet male, who will be a cuddler, loyal, mellow, yet fun? Look no further than adoptable kitty boy, LITTLE RED! This orange and white cutie loves to snuggle, and his favorite pastimes are playing and sleeping! He was born 2016. Little Red gets along with other nice cats, so if you have a sweet resident kitty, give Little Red a try. He would be fine in almost any type of home--either with children or just with an adult.